I am a huge fan of David De Gea. He has the potential to be a legend at Manchester United, possibly even better than Peter Schmeichel. Right now, he is well and truly living up to his potential, but there is still more to expect from him, especially if he wants to claim rights to be considered the best keeper in the world. Two seasons ago, the young Manchester United goalkeeper was under a lot of pressure from fans and pundits alike. I was not one of those. I have always liked him, and not just because he’s into metal. David De Gea’s performance in the 3-0 home win over Liverpool has been the highlight of his career, however, this seems mostly due to the pressure of the match mixed with the number of one-on-ones that he came out on top of. The problem with this is that he has become a massive centerpiece for United due to the lack of quality defending along with the lack of a consistent set of defenders for him to work with. For some goalkeepers (i.e. Simon Mignolet) they can’t cope with the extra pressure of 1.) playing for a massive club and 2.) dealing with the extra chances created from defensive lapses. When looking at some of the best goalkeepers in the world this is something that should be taken into consideration. I have no idea why Spain continues to select Iker Casillas over De Gea, but I also don’t think that this is something that should be held against him. Statistics cover the respective players league games played. The problem with statistics is that they don’t always tell the whole story. A team’s tactics combined with the various players on the team certainly affect a goalkeeper’s performance and statistics. Manuel Neuer is going to have rather skewed stats based on the league and team he plays on compared to any of the Premier League keepers. What has impressed me this season has been De Gea’s positioning. The fact that he has significantly more catches than punches shows just how confident he is in his ability and his ability to get to balls due to his positioning. The recent Liverpool match showed very clearly just how good he has become in terms of positioning. De Gea has become the Mariano Rivera of goalkeepers this season. I don’t worry about what the outcome will be in a one on one situation. In fact, I expect De Gea to save most chances. If a goal is scored against him it is invariably a cracking good shot that would get past any goalkeeper. In fact, there have been several goal of the season nominees that have gone in against him, which means there was little he could have done. David De Gea may not be the best goalkeeper in the world or even in the Premier League, but if he continues to develop in the way that he has, then he does have every chance to become the best. In fact, I would say he has the chance to surpass even the greatest of all time, provided he continues on this path. 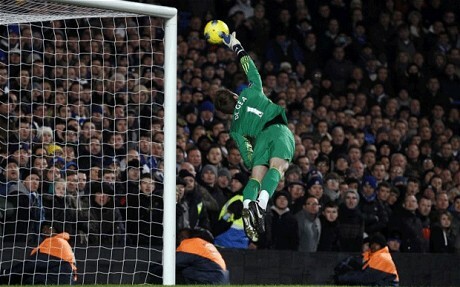 Home » Premier League Perspectives » David De Gea – The Premier League’s Best Goalkeeper?